Reynolds Gallery is pleased to announce the opening of an exhibition of oil and watercolor paintings and ink drawings by Nell Blaine. Blaine was foremost an abstract painter, learning under Hans Hofmann in the 1940s. She immersed herself in the post-World War II New York art scene, which embraced color and gesture through Abstract Expressionism. The acute sense of hue, shape, and line apparent in her oil paintings originate in part from her early stages of art making, characteristically unabashed and intuitive. Instinct carried Blaine through her work; in 1959, she contracted bulbar-spinal polio which paralyzed her from the waist down, forcing her to relearn how to paint. She began painting in oils with her left hand, adding a genuine looseness and determination. This persistence seeped into each scene as Blaine transitioned to a representative style, her hand capturing parks and rivers outside her Gloucester home, and floral studies neatly arranged in her kitchen. 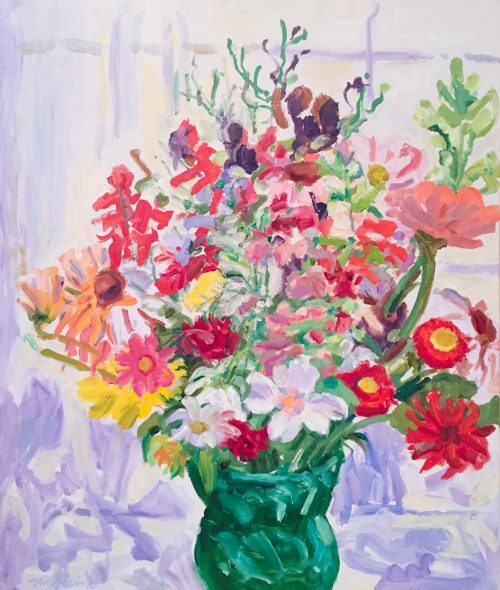 Nell Blaine, Midsummer Flowers, 1990, oil on canvas, 26 x 22 inches. Image courtesy of Reynolds Gallery.